Americans see water as abundant and cheap: we turn on the faucet and out it gushes, for less than a penny a gallon. We use more water than any other country in the world, rarely considering the consequences for our rivers, aquifers, and other freshwaters. 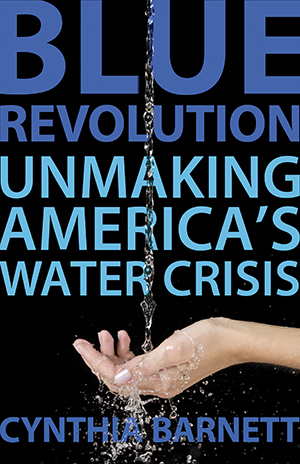 Blue Revolution exposes the truth about the water crisis-driven by a tradition that has encouraged everyone, from homeowners to farmers to utilities, to tap more and more. But the book also offers much reason for hope. Reporting from across the country and around the globe, award-winning journalist Cynthia Barnett argues that the best solution is also the simplest and least expensive: a water ethic for America. Just as the green movement helped build awareness about energy and sustainability, so a blue movement will reconnect Americans to their water. Avoiding past mistakes, living within our water means, and turning to “local water” as we do local foods are all key to this new, blue revolution. During America’s retreat to the suburbs in the 1950s, large home lots, disposable incomes, and a nifty concrete spray called gunite gave families a new marker of success: the backyard swimming pool. For the rest of the twentieth century, residential pools symbolized upward mobility and offered a sense of seclusion not possible at city pools or even private clubs. The following decades redefined our relationship with water itself--from essence of life to emblem of luxury. By the time of the twenty-first-century housing run-up, even the plain blue pool had lost its luster. Adornments were needed. Aquatic affluence meant floating fire pits, glass portholes, and vanishing edges, which create the illusion of never-ending water. The amenity to envy was no longer the diving board. The musthave, now, was the waterfall. No community glorified the trend like Granite Bay, California. Granite Bay is nestled on the north shores of Folsom Lake, commuting distance east of Sacramento. The upscale suburb is named for the Cretaceous age rock that underlies this region in the foothills of the Sierra Nevada. But during the housing boom, Granite Bay’s developers were determined to upstage the area’s natural geologic outcroppings. In Granite Bay’s best backyards, rocky waterfalls cascade artfully into boulder-lined swimming pools, set off with grottoes, swim-up bars, and built-in hot tubs. Thick bushes and trees bearing flowers and fruit adorn the watery wonders, making a place naturally dominated by needlegrass and sedge look more like Fiji. Precisely groomed lawns, a quarter acre and larger, complete the sublimely unnatural tableau. Such fun has helped push average water use in Granite Bay to among the highest on Earth. Its residents use nearly five hundred gallons of water a person every day--more than three times the national average. Even when drought conditions cut federal water deliveries to California farmers and closed the state’s salmon fisheries, Granite Bay residents continued to consume water as if it were as plentiful as air. After three consecutive years of California drought, Folsom Lake--actually a reservoir created by a dam on the American River--was so dry, it looked like a moonscape. As water levels plummeted in summer 2009, officials from the U.S. Bureau of Reclamation, which manages the lake, ordered all boats removed from the Folsom Marina. Yet the San Juan Water District, which supplies Granite Bay from the reservoir, informed its customers that summer they would have to endure no mandatory water restrictions. Spectacular squander in the middle of a water crisis is not much of a shock in the United States, where we use about half our daily household water bounty outdoors. The dryer the conditions, the more we tend to pour. What is surprising, however, is to find some of the world’s worst waste in the Sacramento metropolitan area. That’s because Greater Sacramento has become a national leader in finding solutions to America’s energy and climate challenges--and in working to solve other problems brought about by suburban growth. Sacramento glitters with all things green. But when it comes to water, the city represents a national blind spot. Somehow, America’s green craze has missed the blue. California’s capital likes to call itself “Sustainable Sacramento.” The progressive municipal government is spending heavily on light rail and constructing only green city buildings. The utility generates solar, wind, biomass, and hydro power for customers willing to pay more for renewable energy. Sacramento’s citizens choose to do so at some of the highest rates in the nation. The city is so green, it provides organic food to public school children, bike racks to businesses, and free trees to residents who want to cool their homes with natural shade. But with water, Sacramento isn’t so enlightened. The metropolitan area, which lands regularly on lists of top green cities, smart cities, and livable cities, also has earned this startling ranking: it squanders more water than anywhere else in California. That distinction makes it one of the most water-wasting places in the United States. And that makes it one of the most water-wasting places on the planet. Residents of the metro region use nearly 300 gallons of water per person every day--double the national average. By comparison, the equally affluent residents of Perth, Australia, use about 75 gallons per day. Londoners tap about 42 gallons per day. The water-rich Dutch use about 33 gallons daily. Grottoed communities such as Granite Bay aren’t solely to blame. Some of the same politicians who forged the new path for energy in Sacramento fought for the city’s right to keep to the old road for water. The city is one of the last major metro areas in the nation to hold on to flat rates that charge residents the same no matter how much water they use. In 1920, Sacramento had amended its charter to declare that “no water meters shall ever be attached to residential water service pipes.” Only an act of the state assembly, which requires the measuring of water use statewide by 2025, has the city installing meters these days. Sacramento is by no means unique. Even as our green consciousness evolves, we often manage to ignore water not only on a global level but also in our own backyards. The Copenhagen climate accord, negotiated by the United Nations in 2010, did not mention the most immediate threat from a changing climate--the worldwide freshwater crisis. Across the United States, we give little thought to our water use even as we replace lightbulbs with compact fluorescents and SUVs with hybrids. The conscientious consumer who plunks down $25,000 for a Prius may still wash it every weekend in the driveway. The office manager who rallies every department to recycle paper is unaware of the millions of gallons of water a year that could be recycled from the building’s air-conditioning system. One part of the answer is the illusion of water abundance. When we twist the tap, we’re rewarded with a gush of fresh, clean water. It’s been that way since the turn of the twentieth century, when Americans perfected municipal waterworks, indoor plumbing, and wastewater disposal as a response to diseases like cholera or typhoid fever. Water is also our cheapest necessity. Four-dollar-a-gallon gasoline helped drive consumers to cars that cost them less to operate. Lower fossil fuel consumption and reduced carbon emissions are fringe benefits to protecting our pocketbooks. No equivalent economic incentive makes us think about our water waste. In fact, our water is so subsidized that many Americans pay less than a tenth of a penny a gallon for clean freshwater delivered right into our homes. “As a society, from a water standpoint, we’re fat, dumb, and happy,” says Tom Gohring, executive director of the Sacramento Water Forum, a coalition of business, environmental, and other competing water interests that work together to find solutions to the region’s water woes. “In the history of our country, we’ve had some serious water shortages, but very, very seldom have people been told that they cannot turn on the taps but for an hour in the afternoon, or that they must boil water. This is true in Sustainable Sacramento, and it’s true in the scorched Southwest. The most conspicuous water consumption in America is often found in those parts of the country where water shortages are most serious. Nationwide, we use an average of 147 gallons each day. In wet Florida, the average hits 158 gallons. In Las Vegas, it’s 227 gallons per person--in one of the most water-scarce metro areas of the United States, where water managers lose sleep at night thinking about what will happen when the level in Lake Mead drops below the intake pipes that carry water to the city. Vegas swimming pools--with their glass walls, underwater sound systems, sushi bars, and stripper poles--make Granite Bay’s look like they came from the Kmart garden department. But in both locales, the extreme illusion of abundance makes it all but impossible for people who live and play there to notice their personal connection to the nation’s water crisis--to understand how wasteful water use in one house, in one backyard, multiplied by 310 million Americans, equals trouble for the generations to come. Profligate water use today will imperil future generations, the same as profligate use of oil, destruction of forests, and other environmental tipping points will. But water is much more important to our future than oil. That’s because there are no alternatives to it, no new substitute for life’s essential ingredient being cooked from corn, french fry grease, or algae. Like our other great, national illusions--say, the unending bull market, or upward-only housing prices--the illusion of water abundance is a beautiful bubble doomed to pop. With petroleum, those $4 gas prices sparked a collective “Aha!” moment for Americans. But there’s been no “Aha!” in the case of water, even though the largest of our waterworks are beginning to show a few cracks. Let’s put it this way: It will not be fun for the grandkids.